Our annual food giveaway was a success! Compassionate Action for Animals' favorite way of introducing people to new vegan foods is to provide free samples to the public. 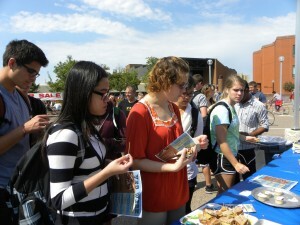 We hosted our annual Vegan Food Showcase on September 11 at the University of Minnesota, Twin Cities in Minneapolis. The event was a smash hit. 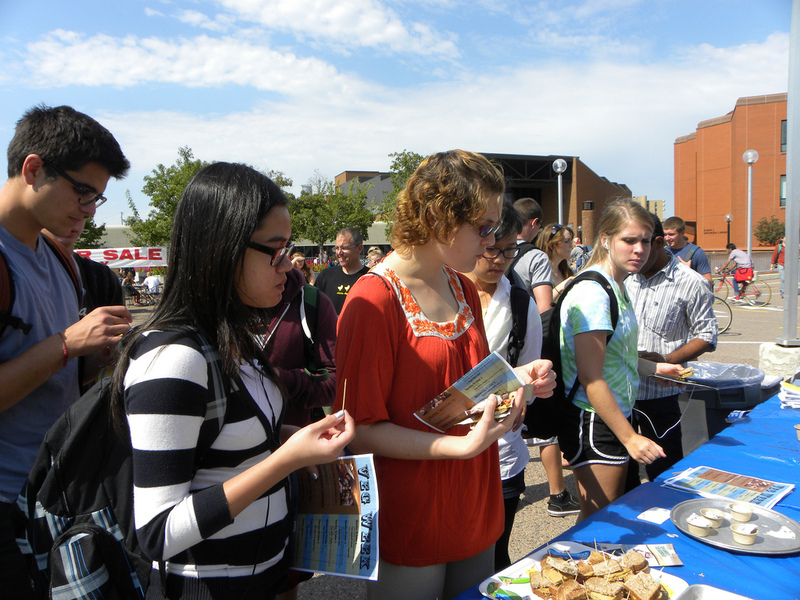 The table was constantly swamped with students trying out the food during the passing time between classes. Many students remembered Veg Week from last year and were very excited to take the Pledge to be Veg once again, promising to change their eating habits from September 29 through October 7. They warmly remembered their favorite foods and restaurants that they enjoyed during that time. Some of the foods that students got to try were chocolate Silk soy milk and Coconut Bliss ice cream. The Gardein 7-Grain meat, which is made with grain, mimics real meat in both its taste and texture. The mock chicken crispy tenders and "beefless tips" were a big revelation for many students that veganism isn't just about salads. During the lower traffic moments, passers-by were excited to hold an in-depth conversation with the volunteers. Once students had a little more information and asked some questions of a practicing vegetarian or a passionate vegan, they were much more likely to sign up. The main selling point in convincing people to sign the pledge was to tell them about the support system the CAA offers for the week. The students who seemed wary about pledging initially warmed up to the idea once volunteers mentioned the available coupons, Vegetarian Starter Kit, and the supporting events held throughout Veg Week so that novices and experts alike can come together with questions and struggles. In total, 289 people pledged to join us in celebrating and participating in Veg Week! In addition to signing up people to Pledge to Be Veg, we passed out 843 leaflets about factory farming and vegetarianism, educating them about the horrors of modern animal agriculture and compassionate alternatives. CAA is proud to host Veg Week's exciting events, including a free concert on Saturday, September 29 and a Feed In and film screening on Monday, October 1. See you there!